A disaster does not have to come in the form of a fire or a flood. A loss of a critical business application or its associated data can have a similarly devastating impact on your business and your ability to serve your customers. Whether you lose data, a business critical application, or your building, Codestone Cloud Recovery ensures your business remains operational. By utilising our cloud based infrastructure we are able to replicate your environment and have this on standby. Should you ever need it then this can be quickly placed live and accessed by your people from any location. Our Network Operation Centre runs 24×7×365, so we are always on hand. Whether you have lost a file, a system, or your office, we are ready to recover for you. On your call, we assess the situation and our team executes the agreed and tested plan. We quickly recover your services and if required provide you with a virtual environment that can be accessed from any location. We even take care of notifying your end-users through SMS, giving them precise instructions on what to do and how to access core systems. Taking a holistic approach to business continuity is essential and this is where our experience adds considerable value. By taking a ‘services’ view we consider not only your business critical applications but also their dependencies. We then create a plan that enables recovery within an agreed timeframe, designed with an appropriate balance of speed and cost. We also take the time to validate plans and regularly rehearse the execution of these plans. Your business and its systems are ever changing and evolving. To ensure your disaster-recovery plan does the same, we regularly test its invocation and make adjustments where needed, ensuring that a ‘for real’ invocation will deliver as intended. Codestone Cloud Recovery is a service that ensures your business remains operational. We work with our customers to define what data, applications and access points are critical to the business. We then put in place the plan and capability to recover these items, should some or all of them be rendered unavailable. By utilising our cloud based infrastructure, we are able to replicate your environment and have this on standby should you ever need it, and if you do, then this can be quickly placed live and accessed by your people from any location. Peace of mind that you have a comprehensive business continuity plan in place. The reassurance that you know your BC plan will work should the need arise to execute it. A team there 24×7 just in case you need them to take your disaster in their stride. 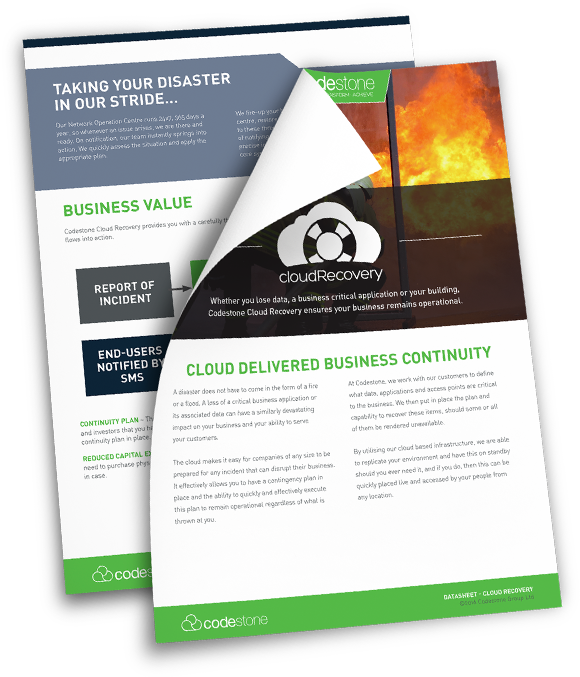 Discover more about Codestone Cloud Recovery and how we can put in place a holistic business continuity plan. Find out more about how we can deliver business continuity for you by chatting to one of our experts. At Codestone, we’re not just IT experts; we truly understand how to deploy technology in a business to drive value, growth and unlock every person’s full potential. We work with you to understand your needs and roadmap what systems, applications and connectivity you need to fully address these needs. We then create your environment from the comprehensive portfolio of cloud services we offer and tailor a managed service that is right for you and your business.